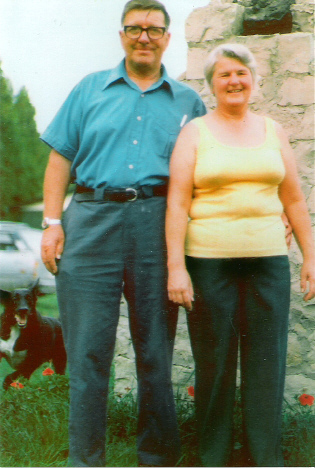 This is a picture of Mum and Dad that was taken in Howdenvale ON. which is where they retired to in 1974. Map of Kidderminster GB Kidderminster is the main area and Ombersley is the town where Mum lived and where I was born. This is a story about how Margaret C Pheysey, Peg, and Albert L. Wheeler, Les, met. It was wartime. Second world war Britain. Mum told this story to me sometime ago and I find it very interesting to know how life works it's self out. In Nov. 1940 her dad, Donald Howes Pheysey was in Hospital in Worcester England. He had been operated on for a hernia. At that time, so long ago you were kept in hospital for six weeks. Visiting hours were from two until four p.m. only and only on Sunday and Wednesday. To go to visit her dad, Peg had to take a bus from Ombersley that would arrive in Worcester at noon. To fill in the time until visiting hours Peg decided she would go to a show at the cinema. Well the show didn't start until 12:45 so she was just standing in line waiting. Well this man, standing right behind her, asked, with a most foreign accent, "hey what time does this joint open". Peg, ever the helpful one turned to answer and saw this tall uniformed Canadian soldier with beret and fancy hat badge. He said he was on his first leave in England and had come to Worcester to visit a sister of his mom and cousins. When the show did finely open they went in together and sat side by side. At intermission when the lady with candy and cigarettes came round Les bought her a small box of chocolate. Peg had to leave early to go to the hospital. The tall handsome stranger decided to leave with her and off they went to the Hospital. After visiting when she came out Les was still holding up the wall outside. He walked with her to the bus and always the gentleman he saw her home. Being very hospitable Peg invited him in and then when it was time for the last bus she saw him off at the station. The next day he was back by noon and from then on Peg and Les were an item. The Essex Scottish was from Windsor Ontario Canada and they were stationed at Aldershot a large army base in England. There was a Wheeler cousin there and she eventually invited Peg for a weekend. There was no other way she would go even at eighteen. When she arrived Les and Uncle Ted met her. Uncle Ted's first words "Can you cook? We don't want someone who can't cook". From that first four day visit on if Les had 2 or 3 days leave he would come to see her no matter how little time they had. When the war ended in Europe the Essex Scottish were back in England that same day. Les had leave and came over in the middle of the night. He only had that one day and I am the result of that heated encounter. Because Mum couldn't get a war bride birth on a ship in time she had to wait in England to have me. It turned out in the eighth month Mum came down with toxemia so she went in early and I was induced. This was done at the maternity hospital in Stourport, the town Grandpa Pheysey was from. Praise God I was okay. Finely a war bride berth came available in May and we were off to Canada. Both the Wheelers and the Royal Canadian Legion royally greeted mum in Windsor. Then a short time later, on June 17th 1946 a class four tornado went through what was then west Windsor and Sandwich East. That is just where we happened to live. We lost everything but that of greatest value and most important, each other. Thanks Mum for taking the time to send this and for being so generous to strangers.